You ride your own motorcycle from home to Georgia, Kyrgyzstan, Mongolia, or all the way to Tokyo in Japan. We did this tour for the first time in 2016. Partly in response to the reactions of participants who rode part or all of this journey in 2016, we decided to make some adjustments to the trip. In particular, we built more rest days into the tour. We ride over the most spectacular roads of Europe through Romania and Bulgaria to Turkey. Through the interior of Turkey along the Black Sea coast to Georgia, then to Armenia and back again to Georgia. We ride from Georgia to Azerbaijan. To Iran, then along the south side of the Caspian Sea and on through the desert landscape of Turkmenistan to the bizarre capital city Ashgabat. Via amazing Derweze we ride north towards Uzbekistan and visit the famous ancient Silk Road cities Chiva (Khiva), Bukhara and Samarkand. In Tajikistan we ride over the Pamir Highway and enter Kyrgyzstan from the south. 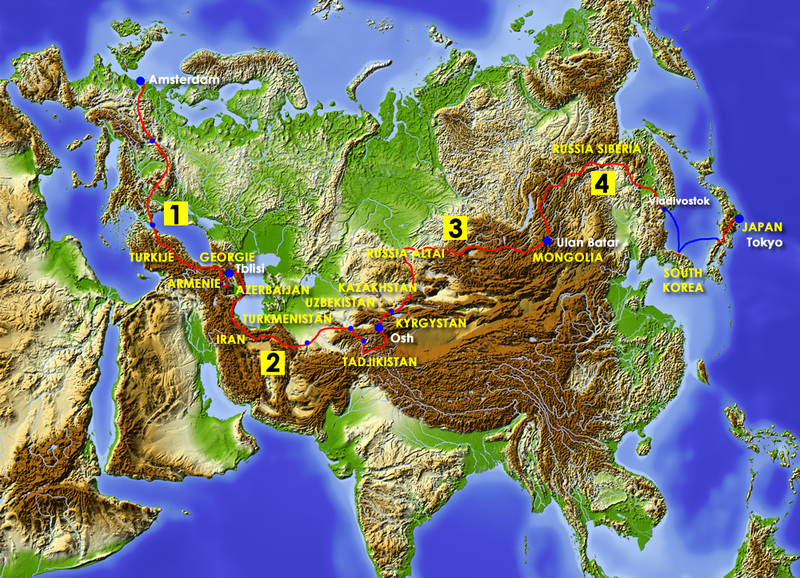 We ride from Kyrgyzstan to Kazakhstan, then through the Russian Altai to enter Mongolia. Through beautiful, little visited West Mongolia, we ride to the capital Ulaanbaatar. We leave Mongolia and arrive in Siberia in eastern Russia. We ride to the easternmost and strikingly modern Russian city of Vladivostok. Here we take the boat to Japan. In Japan we ride through the mountains and via Hiroshima and Kyoto we come to the metropolis of Japan’s capital, Tokyo - the end of this tour. You can do the entire tour from your home to Tokyo. However, all stages are also available to book separately or in combination with any of the other ones.